For introductory courses in hospitality. Exploring the Hospitality Industry fills a vital need: to broadly cover the hospitality industry and provide a dynamic introduction for hospitality management students. More practical than theoretical, the text addresses the latest trends across hospitality segments — from the traditional realms of tourism, hotels, and restaurants, to growth areas such as event management. The 4th edition examines the latest careers, operations, and management principles within each featured segment. Drawing on new learning outcomes, it analyzes the industry’s newest developments and challenges, while refreshing content to reflect ever-evolving roles and practices. 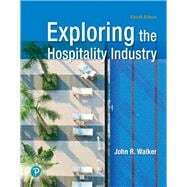 Exploring the Hospitality Industry, 4th edition, will be available in summer 2018 via Revel™, an interactive learning environment that enables students to read, practice, and study in one continuous experience. John R. Walker, D.B.A., FMP, CHA, is a Fulbright Senior Specialist and the McKibbon Professor Emeritus of Hotel and Restaurant Management at the University of South Florida, Sarasota—Manatee. John’s years of industry experience include management training at the Savoy Hotel London, followed by stints as assistant food and beverage manager, assistant rooms division manager, catering manager, food and beverage manager, resident manager, and general manager with Grand Metropolitan Hotels, Selsdon Park Hotel, Rank Hotels, Inter-Continental Hotels, and the Coral Reef Resort, Barbados, West Indies. He has taught at two- and four-year schools in Canada and the United States. In addition to being a hospitality management consultant and author, he has been published in the Cornell Hotel Restaurant Administration Quarterly, the Hospitality Educators Journal andthe New York Times. He is a 10-time recipient of the President’s Award for teaching, scholarship, and service; and he has received the Patnubay Award for exemplary professional performance through teaching and authorship of tourism and hospitality publications. John is an editorial advisory board member for Progress in Tourism and Hospitality Research. He is a past president of the Pacific Chapter of the Council on Hotel, Restaurant, and Institutional Education (CHRIE). He is a certified hotel administrator (CHA) and a certified Foodservice Management Professional (FMP). He and his wife, Josielyn T. Walker, have twins, Christopher and Selina. The Walkers live in Sarasota, Florida. Welcome to You, the Future Hospitality Industry Leaders! Is the Hospitality Industry for You? Does the Train Have a Future?